Soothe Massage Therapy & Bodywork is one of the best therapeutic relief businesses in Edwardsville, Illinois. Soothe offers a variety of services that Adrienne Schaefer, business owner, wanted to start showcasing. These massage services include Swedish Massages, Deep Tissue Massages, Myofascial Release Therapy, Prenatal Massage, & Aromatherapy. Swedish Massages, which utilize a variety of techniques to promote deep relaxation, increase circulation, remove toxins, relieve muscle pain/soreness, shorten recovery time from muscle strain, increase muscle tone, and calm the mind. Deep Tissue Massage is another therapy offered by Soothe, which focuses on realigning the deeper layers of muscle and connective tissue with pressure adjustments over trigger points. These are just a few of the incredible services Soothe offers that anyone can benefit from. Schaefer is the head masseuse at Soothe, and she knew that if she wanted to be taken seriously as an independent business she had to be leaving a digital footprint. So, she searched for a website design solution that could fit with her business. Adrienne’s prior website, before we helped her, was non-existent. Unfortunately, she had to do a lot of manual book keeping and did not have a manageable, public calendar for new clients to sign up for appointments with ease. Massage Keywords were also non-existent, and therefore she was not even coming up in local search results online. All the massage products she offered could not be found online since there was no online store available to her clients. To summarize, Adrienne really needed a Massage E-commerce Website Design. Could she find the professional website help she needed to get her business online by a digital marketing company she could trust? We said yes! Here at Vinnie Mac, we are mainly known for our incredible ability to get businesses to rank for key terms that will grow their clientele base, thereby massively increasing sales, and driving more customers and traffic to a business’s website. 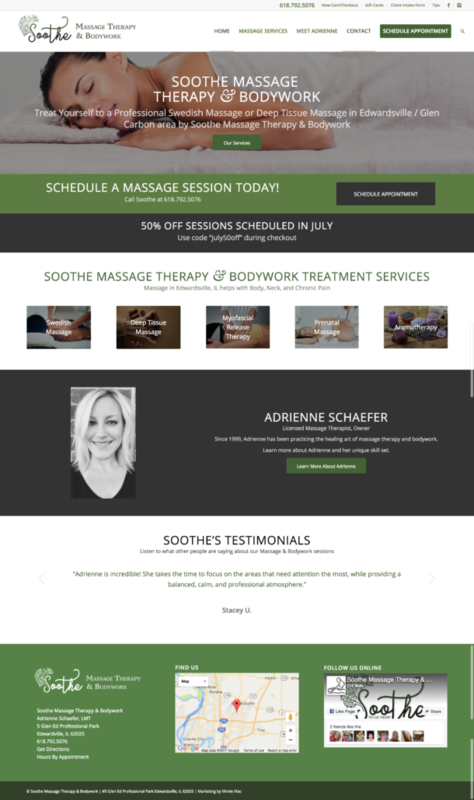 In order to tackle Adrienne’s problem, we first went through extensive research to obtain keywords that would begin to push Soothe Massage’s new E-commerce Website towards the top ranks in local search results over time. Next, we supplied Soothe with a custom website design that matched Soothe‘s brand & color scheme. After that, we implemented a lot of useful features for her massage website. Features including a Calendar for Scheduling Massage Appointments (which replaced manual book keeping), an E-Commerce lay out so that Adrienne could operate a store of products online with relative ease, Search Engine Optimization (SEO) for Massage key terms so that Soothe would begin to rank better when those terms are searched for online, information about ALL of Soothe‘s services and prices are now available at a user’s fingertips. Customers can even purchase gift cards, services, or any other products Soothe chooses to offer. The website offers Social Media Marketing and is connected to her business’s social profiles so that people can get links for discounts and other awesome offers. Client Intake Forms are readily available online to save Adrienne going through countless hours on unnecessary paperwork. All these cool features mentioned and more additional features were added to her site for a functional, easy to navigate site that will now begin to turn interested consumers into paying clients. If you or anyone you know would like their own custom website design, mobile app, or digital marketing solution – contact us here at Vinnie Mac! We are very passionate about online design and we hope that you can give our professional website help a chance. If you want to increase sales and constantly be gaining new clients for your business, you will be making a wise choice to try out one of our diverse package plans. See contact information below or explore our website (https://VinnieMac.com) further to learn more.